Krakow? What’s there to see? Castles, trumpets, holy places, empty chairs, sadness, mirth, grandeur, awe and delicious food…everything a tourist place should be! Look, this page isn’t supposed to be a brochure. If you’re expecting to learn more about Polish culture, buy the box when it comes out. It’ll answer a significant amount of your questions. Cool! Why did you pick it? Right out of college I, like many others, got a lot of job rejections. During Hurricane Irene in August 2011 I was in a library in a small Connecticut town, the only place for a long while that had any type of electricity. One fine afternoon I got news that I had been accepted into an educational Program in Krakow. Coming from a Jewish family, I heard one too many rumors about it being a very xenophobic and hateful place. In my experience, none of it had any inch of truth in the least. Being the root of my entire professional development, I owe the city of Krakow something, as well as Polish culture in general. (I say this as if I haven’t been a walking advertisement for the Polish tourist board ever since I adjusted myself to life in Poland). Krakow, consider this your love letter. And I’m sorry in advance if it can’t contain everything. Will Schindler be featured at all? Considered it, but after a while I really thought that effort would be better spent portraying other aspects of what Krakow is and was. “Schindler’s List” has significant repute in its own right. The places where it was filmed are now filled with so many tourists during high season that you can barely walk through them. This box will go elsewhere. On this note, don’t expect WWII and communism to be central to the box’s plot. Will (INSERT POLITICIAN’S NAME HERE) be featured in the…? Certainly not by name, no. Really, really, REALLY don’t count on it. “Kaverini” is not supposed to be divisive, it is supposed to celebrate cultures and the world. What famous Poles will be featured in the box? It’s a SECRET! Okay, I’ll tell you this much. Enough so that I needed to include a card on how to pronounce their names. As a gift to the world for the day that comes once every four years, it is my pleasure to show you the box that has danced into the world at long last! For those curious, the left-side image is the University Tower, and on the right you can see a pool of turtles, which is a familiar sight to anyone who has ever visited the city and hopped around the educational district. The box will include your best-known Texan heroes (including the namesake of the box), as well as the standard American diet (which will have better effects on your characters in the game then the real things would on your real-life body), and certainly not least, Gerbils, Turtles and…well, a setting that has no artwork at all, you’ll have to get the box and find out what it is! As I continue forward into developing the Krakow adventure box, I’ll have your questions about that answered. For those unaware, my first real position out of college was working as a museum translator and tour guide in Poland, so this game now returns to the place where my professional journey started! Buy the Austin adventure box by clicking on the Product Catalogue above! Deception Island – That’s how it would appear on a map, top-down view. Flat Stanley – “Jared Te Queremos” was a song written by my Spanish housemates in Poland. Dumb Bell (Vlaanderen) and Rogue Remote-Controlled Airplane (the first Kaverini Card I ever drew) both make their appearances in the background. Ice Tongue – it’s actually an ice peninsula if you consulted the Internet. The art of this card? Took a different direction. And a predictable one. Nathaniel Hawthorne = Yeah, that A is red for a reason. The Apple Union – That was the year my parents got married. Trouble Desk – Techniques reference a well-known song that I never wish I heard. That’s a Lemon on the computer instead of another fruit you probably expected. Quiet Sector – That’s the “p” for “pianissimo”, familiar to musicians around the world, to the infinity power. Vivianne – That hit song really exists. In a cold place somewhere. Can’t write anything more about it. There is only so much that can be done in the face of ever-changing illnesses. 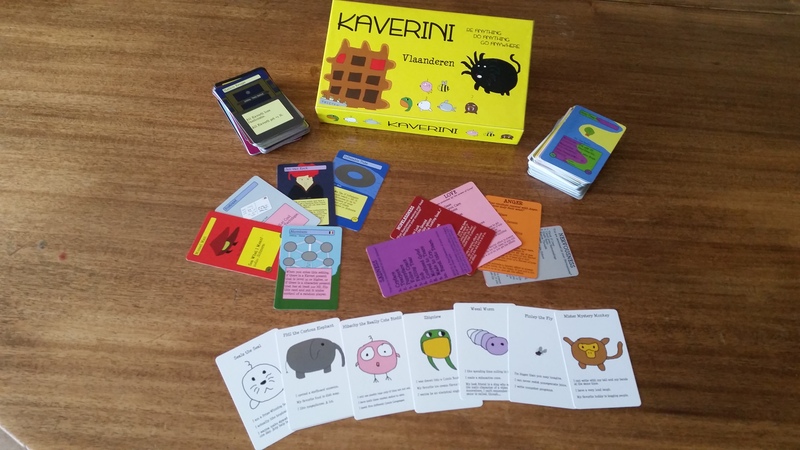 After having the project setbacks for nearly two months, “Kaverini: The Adventure Begins”, an expansion containing 72 cards from the original beta playtest, will be making its way to your tables! (1) The purchase link should be available on the product page at some point before January closes. (2) Some of the art featured is from the original beta playtest, to capture the feeling of a “new exciting” (although perhaps a bit misguided) adventure. (3) There are some issues with the packaging, it may be that you will purchase the packs online and have it shipped to you accordingly, as if from a second-hand buyer. That said, just keep in mind of all of the carbon-based lifeforms that will be saved on account of it! 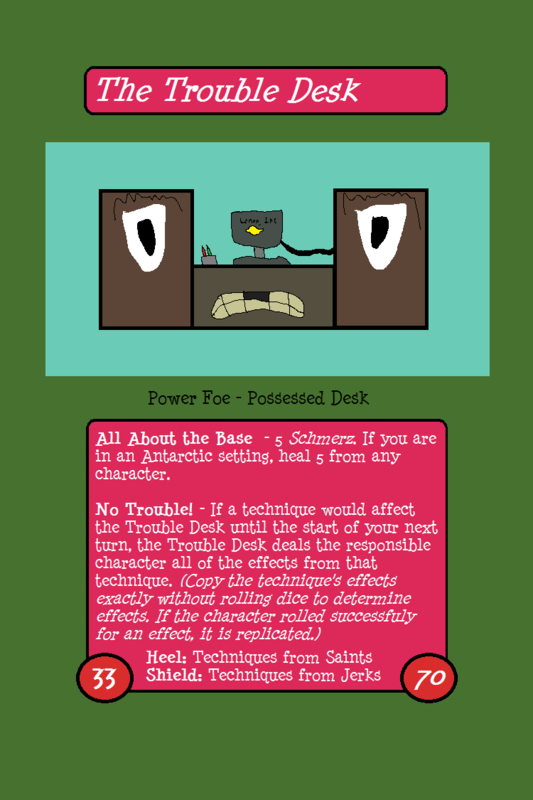 And, the first-ever power foe featured on this website, redone! Here I am, writing from Atlantic City, after the conference has concluded with positive results indeed. 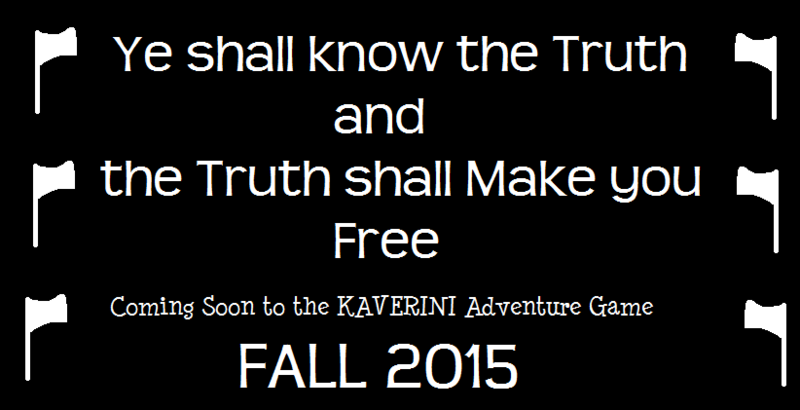 Late 2015, “Kaverini: The Adventure Begins” will be released to the public! Unlike the adventure boxes, this one will come in randomized packs only. The contents of this set will be the Alpha Playtest from April 2015, plus others to replace those cards that would have violated copyright! All continents will be represented in the set! After that, Kaverini: Austin (The Truth Shall Set You Free) will be released! An Adventure Box Going to North America for the first time! A card that has infinite HP. A card that is made to mimic the frustration of having your computer break down. This box is brought to you by the letter G…or, rather, the various ways you can pronounce it! This box will introduce a new card type! KAVERINI VIDEO GAME EDITION IN THE EARLY STAGES OF DEVELOPMENT! 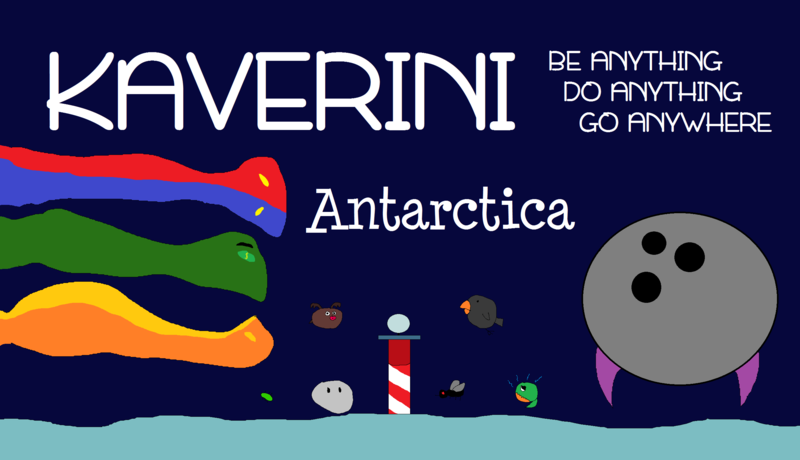 Kaverini: Coming to the Game-A-Con, Atlantic City, November 2015! Alas, I do have some bad news: Due to an illness, I was unable to create the full card set of “Kaverini: The Adventure Begins” before the 20th of November (which is, incidentally, my birthday). For those of you wondering exactly what “The Adventure Begins” is, it is a recreation of all of the cards from the Microsoft Beta Test on April 29, 2015, in which the first-ever playable version of Kaverini was brought to the public eye. That said…well…almost all…there were twelve cards from the set that would give me cease-and-desist letters if they were published (namely, they were well-known characters from various countries that were protected under copyright law). As a result, these twelve have no choice but to be cut from the set…but…BUT! 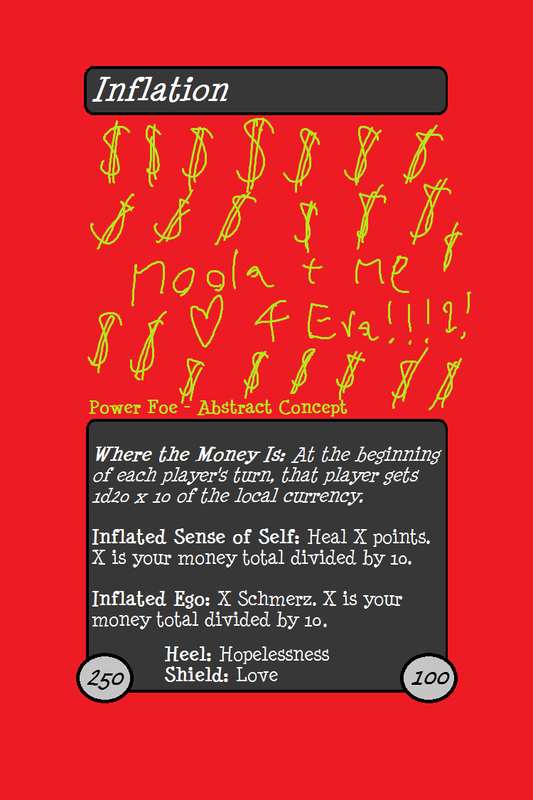 If you go to the Game-A-Con, you are welcome to submit ideas as to what you would like to see made as a card. Heck, even if you don’t go, you’re welcome to suggest something. Any ideas for characters (can be well-known symbols, famous people or folklore characters, a type of class associated with a specific place, like the Swiss Guard at the Vatican, or abstract concepts associated with a place). Anything that otherwise gratuitously violates the boundaries of good taste (e.g. racism and its ilk). The final submissions will be printed in the set with oyur name on it, if I choose to accept it. Kaverini will come for the first time to North America! 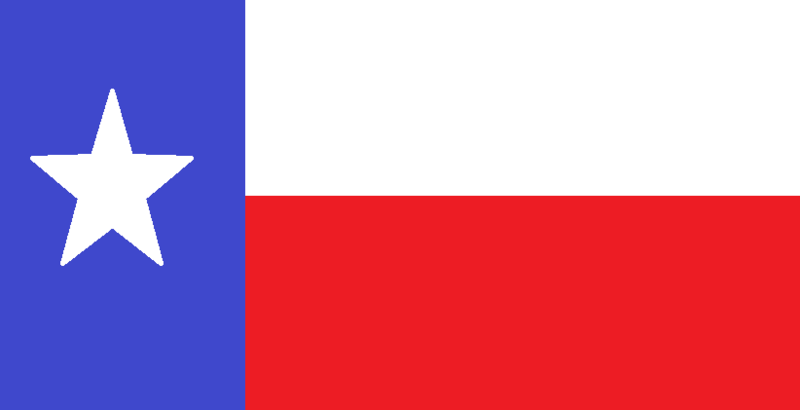 The Six Flags (best known for now being the namesake of an amusement park franchise) represent the six flags that have historically flown over Texas, one of which has been bowdlerized out of existence by my imaginary censors (and you can guess which one). Well, you want to see what I do with it? You’ll have to wait. The tagline, The Truth Shall Set You Free, is a reference to an inscription found on one of the central buildings of the University of Texas at Austin, which is replicated in the teaser above. That inscription is the seed from which the entire plot of the Austin adventure box was hatched. Seed? Hatch? Ugh. Never mind. Anyhow, two more adventure boxes planned, and then I’m going to focus on marketing. Code names are “Dragon” and “Rascal”, and they will be announced in the Wesleyan University Alumni Magazine! Antarctica Box Art + Next Setting Hint! This still has yet to be dolled up with the back box are. I don’t know what either of the things on the other side are, but I recognize that thing in the middle as the ceremonial South Pole. Want to see another adventure box from another setting? Never too late to request it! Announcement: The Road to Adventure Begins! One Jewish Holiday after another, and before you know it, it becomes difficult to remind yourself that your projects even exist. After some discussions about Kaverini within and without my friend circle, I have decided to take upon an additional product release. The “Road to Adventure” packs, which will be released separately from the adventure boxes but will draw inspiration from then, will join the Kaverini product lineup! For those of you unaware of what that is, I have decided to make a small piece of the cards from each adventure box available at random in little packs. For those of you familiar with Collectible Card Games, imagine something like “booster packs”. Unlike with most other CCG’s, however, you can open a set of Road to Adventure packs, or even just one and begin playing a variant of the “Kaverini Strategy Game” right away! I am still debating about the size of the packs, but one thing that is certain is that I will be including cards of all types in them. The Emotional Technique guide will not be included, although each pack is likely to contain one World Point card or one “goodie”. There will be one Power Foe allotted to each pack. I have decided to doll-up the cards from the April 2015 Beta Showcase at Microsoft as a new set that is only purchasable via Road to Adventure Packs. Show the Antarctica box and a few cards from it. Reveal the art of the Road to Adventure Packs. Put the entire “Vlaanderen” spoiler online. Well, enough talk. You want cards. Like this one, that will come in your adventures to Antarctica! Vlaanderen Reference Guide. WARNING! Extraordinary Spoilers Ahead! Addiction – The picture depicts a scan of brain activity. Not just any brain, but a brain beset by the horrors of…you guessed it…addiction! Atomium / Atomium, Turned Alive – The technique “Shield Sphere” is a reference to a Magic Card of the same name, which it resembles in function. aXx d00d – The most popular piece of Art in the Flanders adventure box. Beach Ball Brigade – When I encountered Brussels / Charleroi Airport for the first time, right in the terminal were beach balls hanging from the ceiling. Belgian Chocolatier – The Evil Wafel God is on the tray. Belgium Rail Train – With colors to match. Bell Jar – Not exactly what an art director was looking for, but it seemed like a good idea at the time. Blue Creature Band – There is a map of Belgium on the drum. Blue Creature Club – Possibly inspired by a well-known Belgian franchise involving small blue things. Brussels Fashion District – The cloths, the cloths! Devil Drink – I might get sued for that name, but if I used the name of a copyrighted beverage I would get sued even harder. Druon Antigoon, No Hand / Druon Antigoon, Yes Hand – The giant of Antwerp whose hand is one of the primary landmarks of the city. Dispatched by Silvius Brabo. Fearless Leader – Inspired by a keepsake I received once when I assisted a children’s puppet show when I was working in Poland. 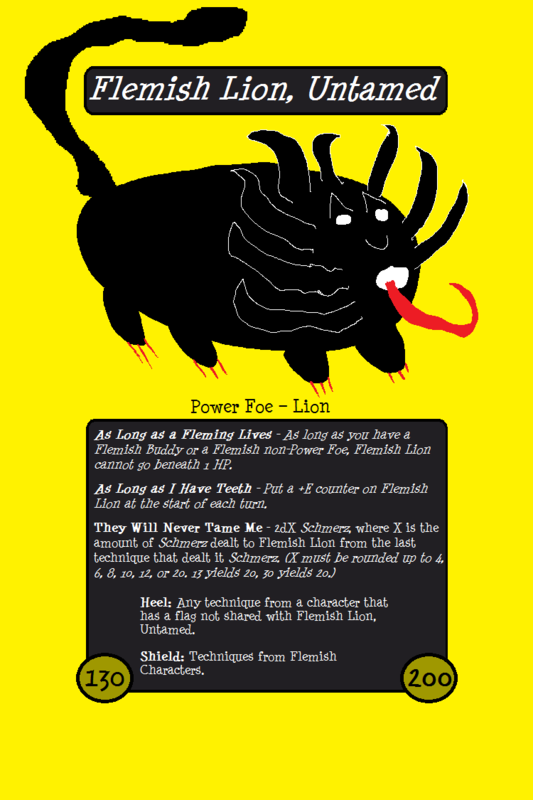 Flemish Lion, Untamed – A sinister version of the Flemish Lion, found on the flags of Flanders. Also visible, although less sinister, on the Vlaanderen Adventure Box Art. Galeries Royales St-Hubert – The fact that the numbers are 302 and 303 are a reference to Lemony Snicket: The Unauthorized Autobiography. The Kaverini Slogan is also sprayed as a graffito with some significant changes. Grand Place – Bird’s-Eye-View of the flower carpets that periodically grace the square. Holy Mackerel – Corrections are for comic effect. Faint Hebrew words in the background reading “Holy, holy, holy”, from Isaiah Chapter 6. Jack of Diamonds – Jack in the Box + well-known character from a film somewhere. Jan Breydel – One of the Bruges Matins’ leaders, inspired by the statue in the Markt in Bruges. Jan van Eyck – Don’t lie and say you don’t recognize that painting. Jan Van Eyckplein – It’s in Bruges. That’s the statue. Land of Strange Delusions and Other Things – Woody Guthrie. King Leopold I – Belgium and Germany buttons on his coat instead of medals, inspired by one of his paintings. The collar design has absolutely no reference to anything whatsoever. Pandora’s Box –The idea of it being a cardboard box? What? You don’t like that? Phil the Curious Elephant – The name “Phil” references the word for “elephant” in Hebrew and Arabic. Pieter de Coninck – One of the Bruges Matins’ leaders, inspired by the statue in the Markt in Bruges. Plantin en Moretus Museum – The museum in Antwerp that houses the world’s oldest printing presses. The displays look like that picture. Postcard – Swedish introduction, “as bilong mi” is Tok Pisin for “My House” (Tok Pisin = Pidgin English of Papua New Guinea) and that address is a museum I worked at once. Schild en Vriend ­– The tongue twister, meaning “Shield and Friend”, responsible for the Flemish victory of the Bruges Matins. The shield has a cartoon Flemish Lion on it. St. Baaf – Inspired by a painting. He’s also the patron saint of Falconers, even if he doesn’t seem too comfortable with it. Taxation – The small font inspired by tax codes around the world. The illustration was inspired by my friend Daniel Scherban who, in middle school (or our closest equivalent) would amass “armies” of robots which were represented by writing the number “9” over and over again and then frequent multiplier and/or exponent marks. (The idea was to say “these are how many killer robots I have”). The Diamond District – I recall a sign with something like the illustration on it. Also, the Saturday-no-effect clause is a reference to the fact that there are many people who work in that area who are Jewish and very religious. The Giant’s Hand / Giant’s Hand Awakened – That landmark in Antwerp. Tourist Bag – Logo inspired by something I actually saw in Bruges. Unsightly Exhibit – My freshman year of college at Wesleyan University I would have a mail server that would constantly swap out images for “This Image Has Been Removed for Security Reasons”. I found a new home for those words here, although not with the same font. The Lamb of God – The primary focus of the Gent Altarpiece, probably the most famous piece of art in all of Belgium. The platform resembles the one in the painting, as does the green background. Weezl Worm – That best friend, see “King Leopold I”. I originally intended the game to be published on the 12th of August, but this fizzled for two reasons (1) publisher concerns and (2) the fact that I had to undertake a family visit to the Midwest. Furthermore, I will be in Iceland over the course of this week. And so the release will come about NEXT week (during the 20+Xth of August, or something like that). But I assure you, this is IT when it comes to postponing the release. When that happens, the links above will be updated with links to purchase the game and to view the new, clearer rulebook AND adventure book for FREE, as well as the reference guide. The adventure book and the reference guide, obviously, contain spoilers! 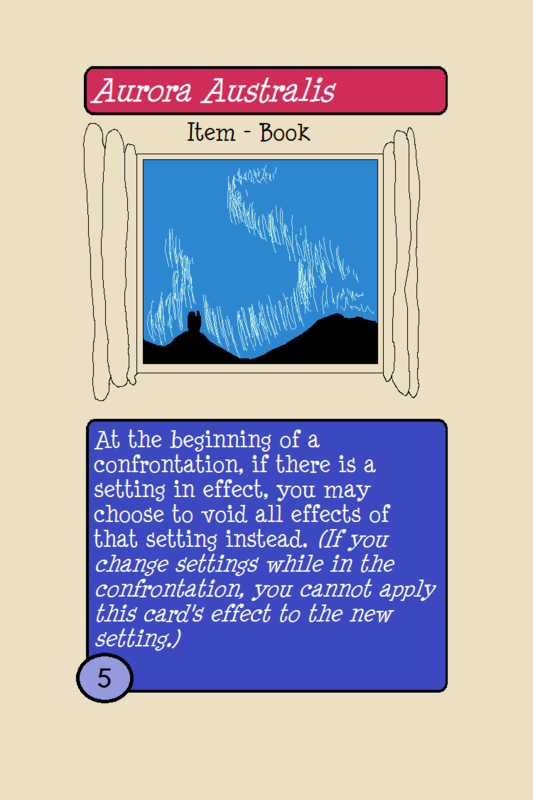 Also, two video tutorials: (1) A playthrough of a confrontation and rule overview and (2) speaking Dutch. From the April 2015 playtest, this returns in the box! If you can’t read it too well, don’t worry, it will be legible when you are holding the card in your hand. What could this be for? And what is it referencing? So that you know, each adventure box will have a card that will be a nod to the next one coming out!